petição: Save More Dogs Like Squirrel. Let's Shut Down Puppy Mills Now. Save More Dogs Like Squirrel. Let's Shut Down Puppy Mills Now. This is Squirrel. An undercover Humane Society of the United States investigator got him from a puppy mill operating without the required licenses in Ohio. The operator is a repeat offender, and is one of the breeders flagged on the Humane Society of the United States' Horrible Hundred list of problem puppy mills. This mill operator reportedly admitted to the media that she neutered puppies herself, without anesthesia or bringing in a veterinarian. The majority of pet stores that sell puppies are getting those dogs from puppy mills. The life of a puppy mill dog is horrific – mother dogs spend their entire lives in cramped cages, when the mother and father dogs can no longer breed, they can be discarded or killed. Due to poor sanitation and a lack of preventive veterinary care, the puppies from puppy mills are often sick. Right now, thousands of animals are locked up waiting to be saved. 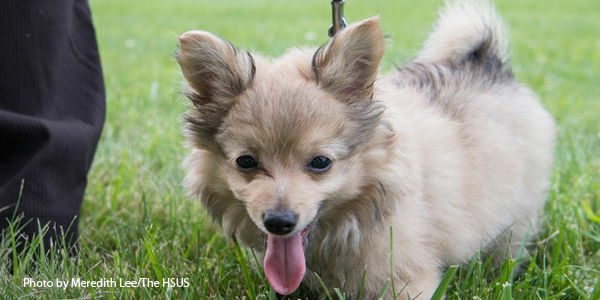 You can fight back against this cycle of cruelty and help bring an end to puppy mills. All it takes is a commitment to adopt your next pet from a shelter or rescue, or purchase only from a responsible breeder who will show you where your puppy was born and raised. Then, do even more by purchasing pet supplies from stores and websites that don't sell puppies. Sign and pledge to adopt your next pet from a shelter or rescue, and to support stores and websites that don't sell puppies.